Sapphire has started sales of its external Thunderbolt 3 enclosure for video cards. The GearBox TB3 eGFX box can accommodate a high-end graphics card and also offers additional USB 3.0 Type-A and GbE ports. It is noteworthy that the box costs less than competing offerings and Sapphire also offers it with bundled graphics cards. 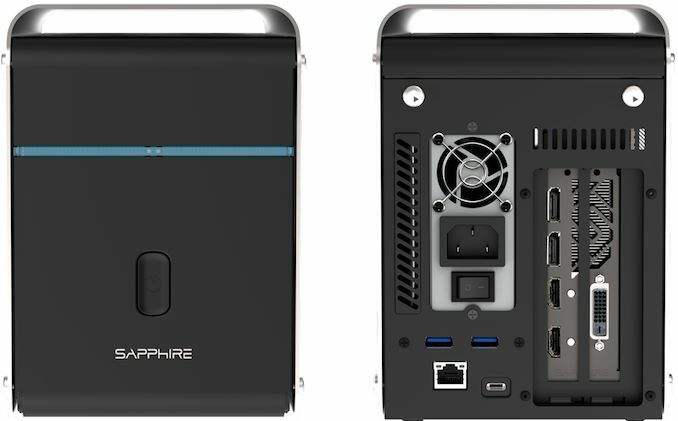 Sapphire is a bit late to the eGFX party as most of leading suppliers of graphics cards have already released their Thunderbolt 3 eGFX boxes. However by no means is Sapphire cutting corners here. Being equipped with a 500 W custom power supply, the GearBox Thunderbolt 3 eGFX expansion chassis can accommodate full-length double-wide graphics cards up to 266 mm long, and a max power consumption of 300 W. Technically it can support even NVIDIA’s latest TITAN RTX graphics card if needed, as it has two 8-pin PCIe power connectors. 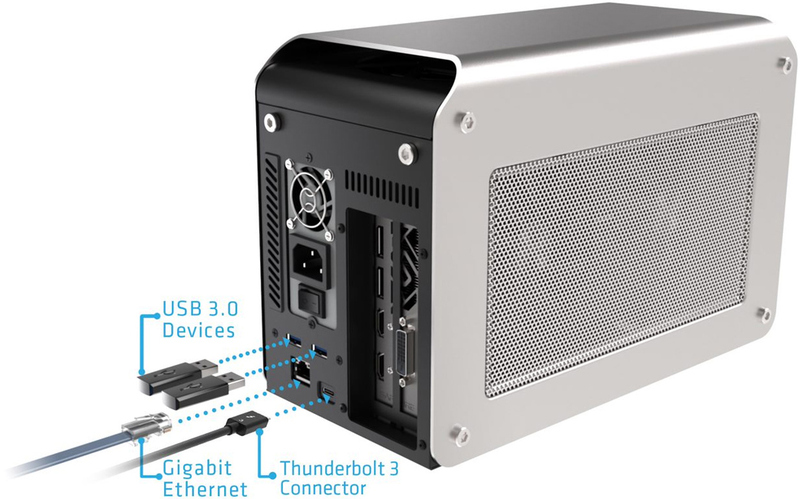 The GearBox TB3 eGFX box can deliver up to 60 W of power to the host laptop over a TB3 interface, and provides a GbE connection as well as two USB 3.0 Type-A ports, which essentially means that the product can be used as an expansion dock for contemporary laptops. 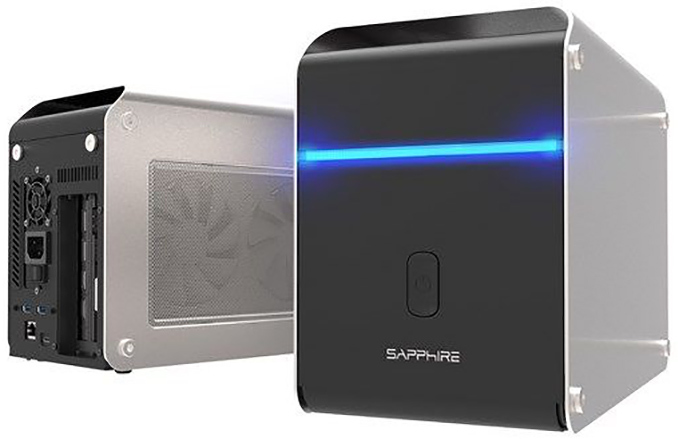 The design of Sapphire’s GearBox somewhat resembles that of Apple’s Mac Pro desktops from 2000s, yet it is evident that the chassis is considerably smaller. Meanwhile, the box has a blue LED on the front to emphasize its own color. 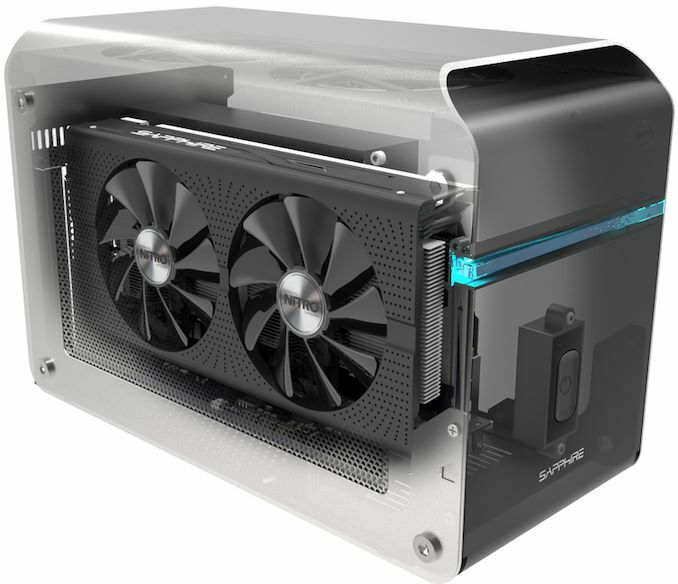 The enclosure has its own dual-fan cooling system, which assists cooling system of the graphics card. Sapphire’s GearBox Thunderbolt 3 eGFX expansion chassis is now available from Amazon at $259, which is below its MSRP of $339. The box is also available with bundled Sapphire Nitro+ Radeon RX 580 and Sapphire Pulse Radeon RX 580 graphics cards for $538 – $578. That's really borderline inescapable. To handle oversized coolers and the airflow for both blower and open air coolers you need a decent amount of space around the card on all sides except the back. From there, if you put the PSU behind the GPU you then end up with a large amount of dead space since a normal PSU is much shorter than a full size GPU. As it is, this PSU appears to only have a 40mm fan. That size is common in 1U servers; and because they need to have very high RPMs to move any significant amount of air they tend to be really loud. I'm hoping the PSU can passively cool itself at typical GPU loads and never need to spin the fan past idle. The non-space wasting layout would be to put the PSU in line with the GPU for a really long enclosure; something that AFAIK no one has done. > However by no means is Sapphire cutting corners here.